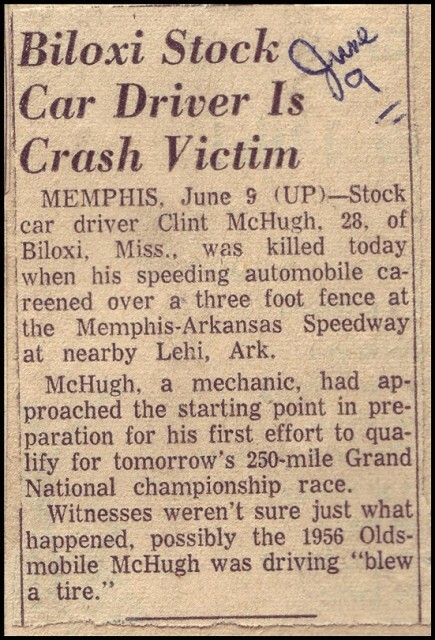 Story told by Mississippi Racing Pioneer Noel Wynne : In my opinion Clint McHugh was the best driver I have ever seen. He could get everything a car had to offer out of it. Chicken McCombs had two very fast race cars, the 248 and 631. The great Ival Cooper was Chicken’s driver. Chicken ask Ival if it would be OK for Clint to drive one of the cars and Ival said sure. Clint told Ival to pick his car and he would drive the other one. Ival chose the 248. Clint took car 361 and turned the fastest qualifying lap of the night. In the Trophy Dash, Clint won the race beating Ival. Ival decided the he wanted to drive the 631 in the next race. Clint then to the 248 to the checkered flag in the next heat race beating Ival who was now driving the 631. Clint went on to win the Championship Race and scored the maximum amount points possible for the night. Clint was born to drive !